We spent the night in a rather marginal RV park in Price, UT. They had an interesting strategy with regard to cleaning: 3 showers, so disable 2 so you only have to clean one. Ditto with the toilets. And, the simplest method to reduce litter from paper towels is to not provide any. These detractions stated, there was plenty of hot water in the shower that did work and there is plenty to be said about that. Plus, they had a laundry facility and that was the real reason for our stay. Once the laundry was completed, we headed back out into the boondocks. Our chosen path was to go up Nine Mile Canyon just to the east of Price. 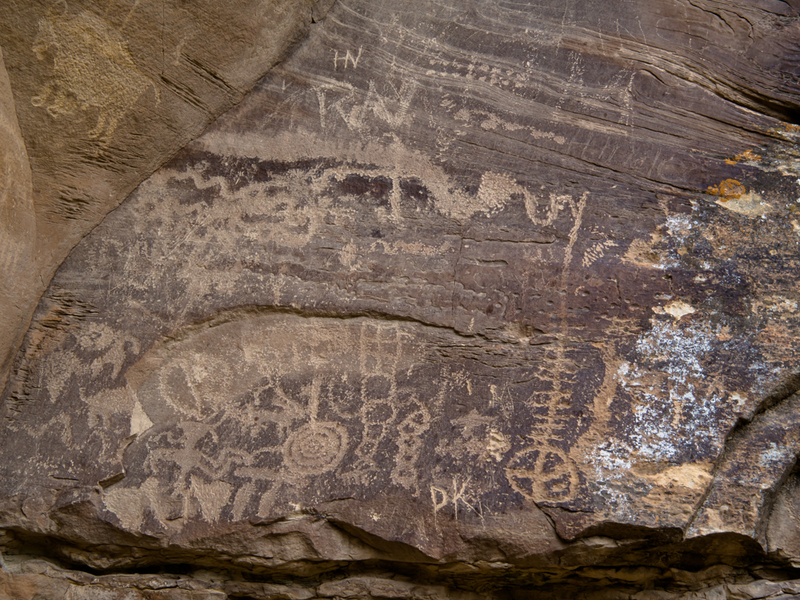 I chose the canyon based on map notations about the large number of petroglyph panels in the canyon. I was surprised to find that unlike shown on the map, the road was recently paved. 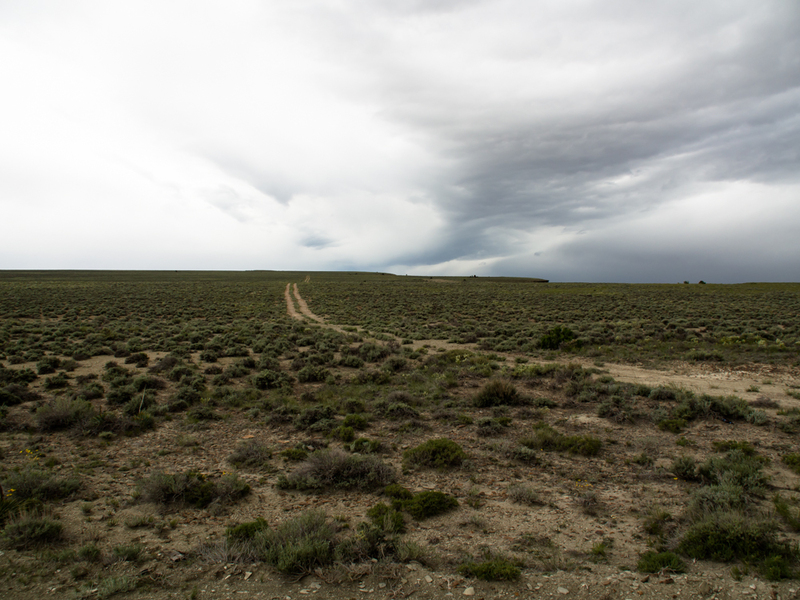 While not longing for another dusty hammering on a rutted dirt road, I was mildly disappointed. 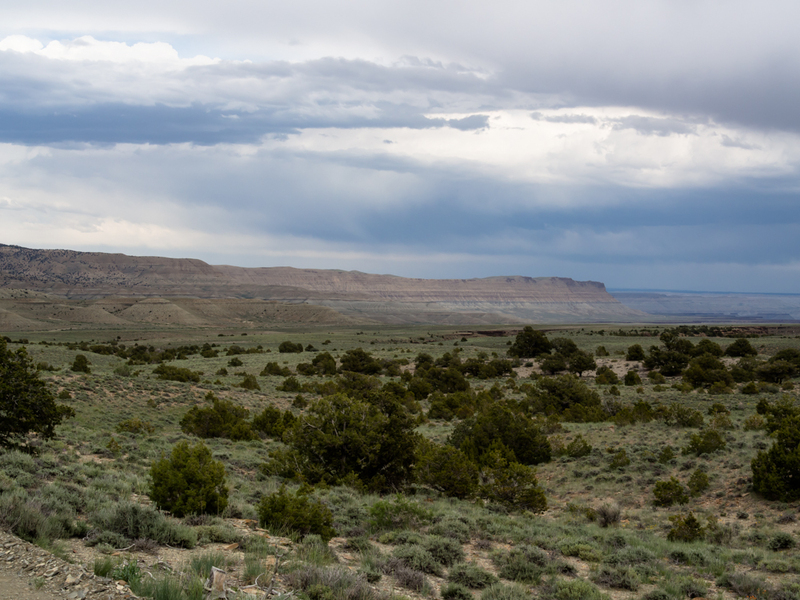 And, despite what our map suggested, most of the bottom land in the canyon was private, so we elected to take another road toward the Green River to see what was there. It was overcast, windy and starting to rain. Early in Nine Mile Canyon we encountered this coal mine next to the side of the road. 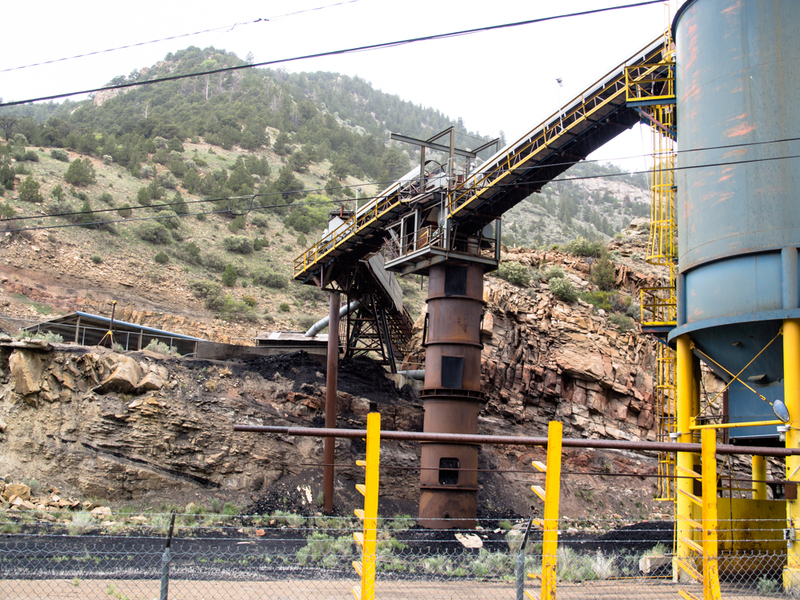 Price, UT is in Carbon County so the presence of a coal mine was no surprise. 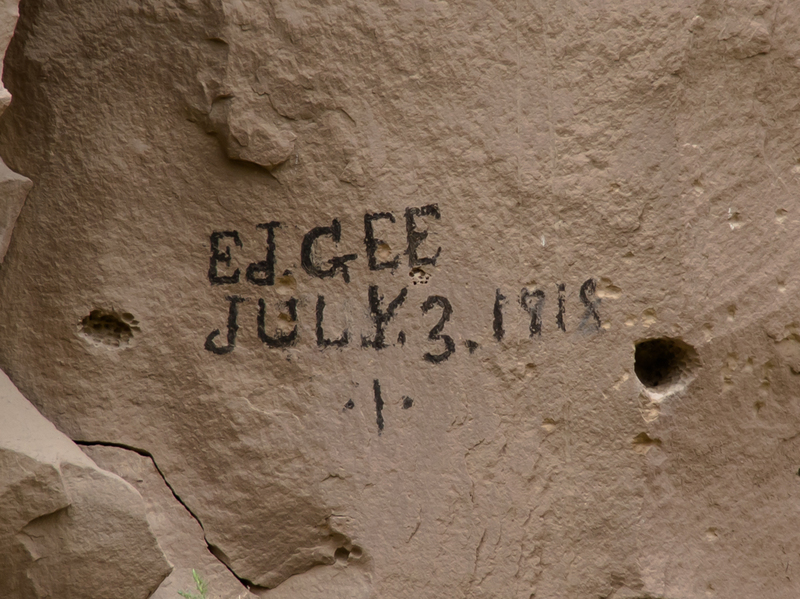 At one of our stops I found this inscription carved into the walls. 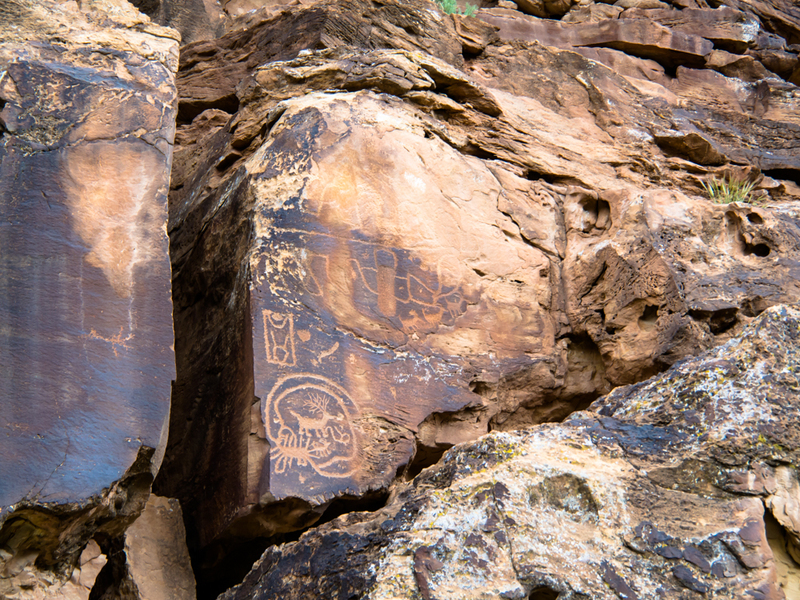 There were many, many petroglyph panels in the canyon. Some were better preserved than others and I have culled the photos to show the best ones. 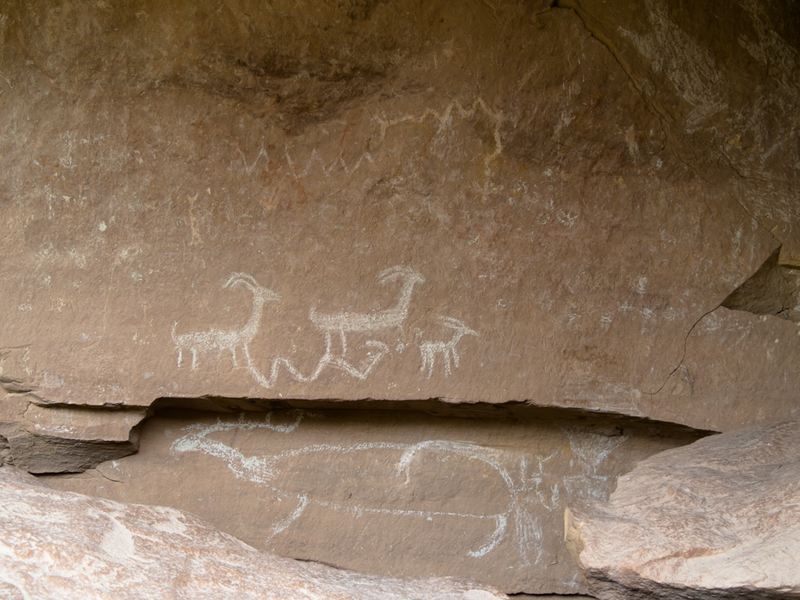 This inscription was characteristic of many of the panels where late-comer white men chose to deface the rock art for their own reasons. This one was noteworthy due to the age and is clearly associated with an early settler. 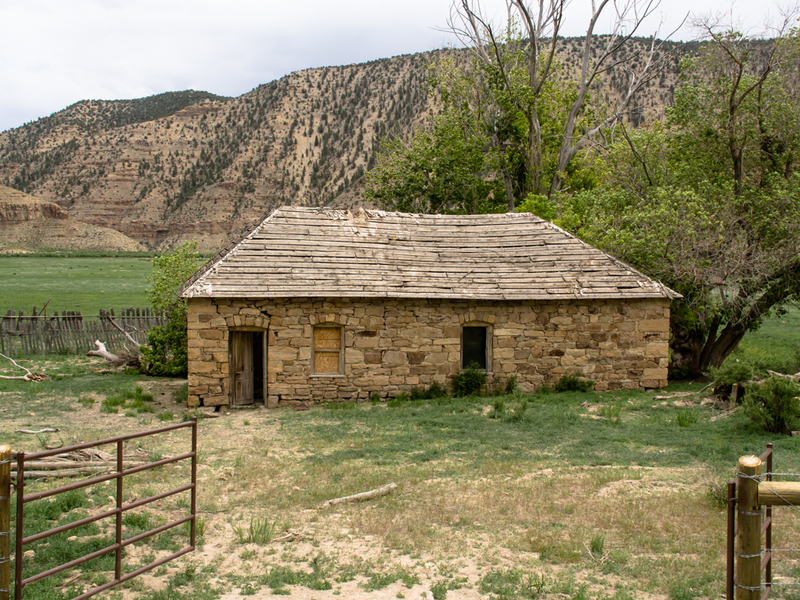 There were many old abandoned log cabins that were used by the early occupants of Nine Mile Canyon. This one included cut timber for the door jam. 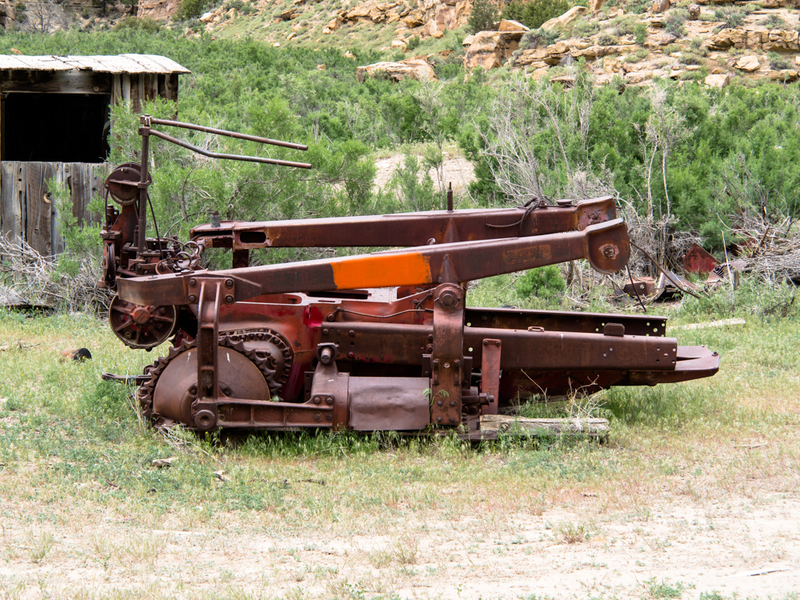 This bulldozer frame is left over from the early part of the 1900s. 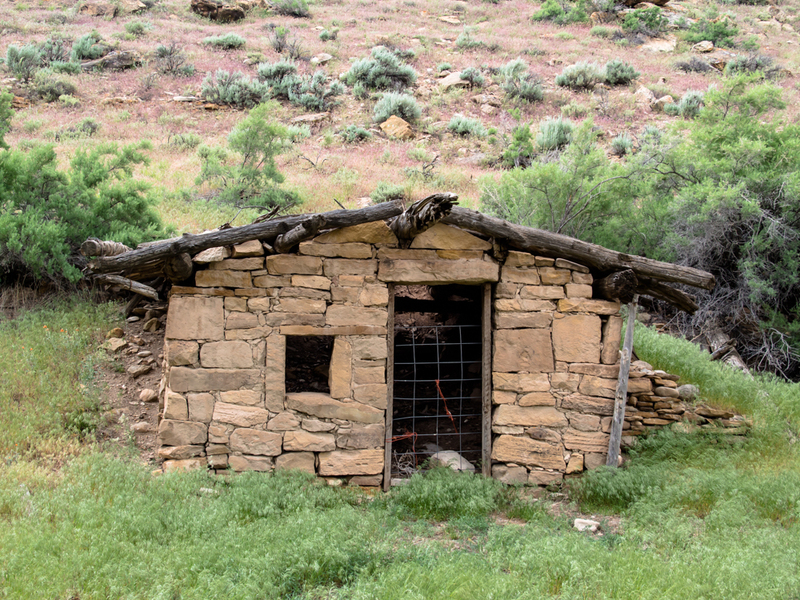 This rock house was on private land next to the road and was not typical of the older dwellings we saw. 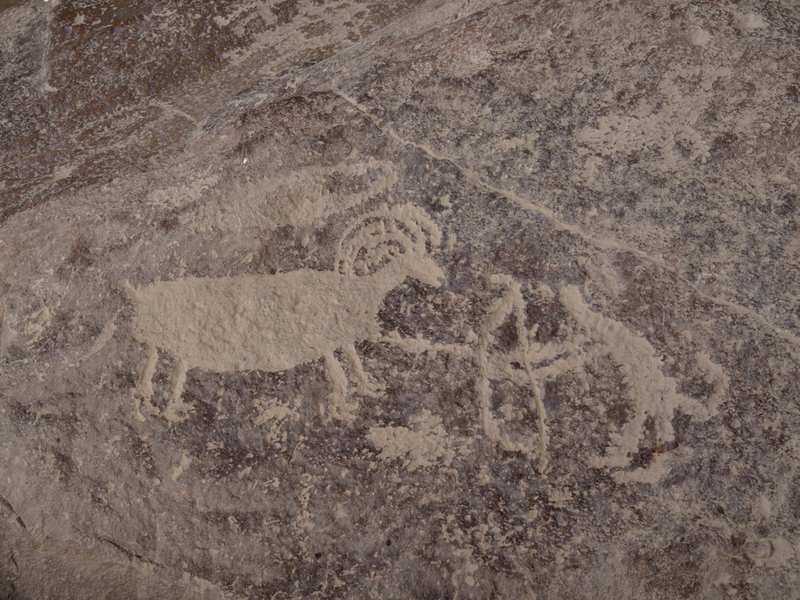 This rock art panel shows the classic scene: mountain sheep. These figures were likely carved by members of the Fremont culture. 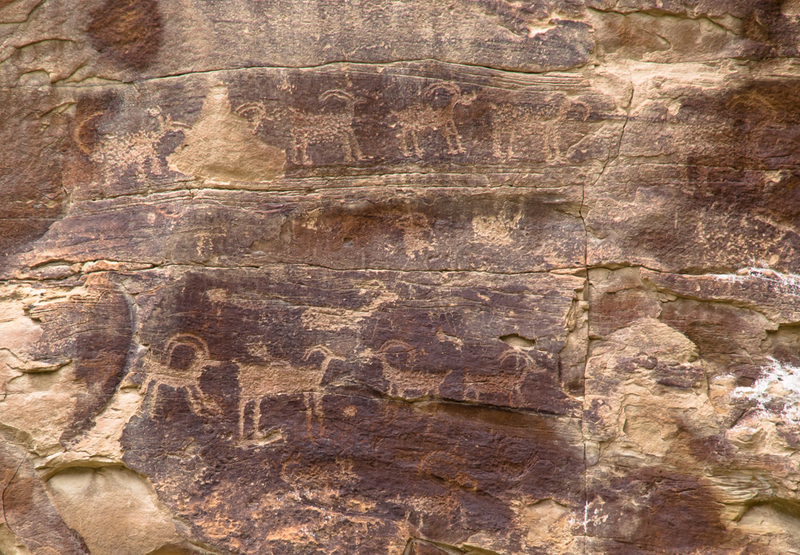 These sheep were "pecked" deep into the sandstone walls thus resisting erosion. Other figures on this panel were already weathered away. This panel was interesting for several reasons. In addition to multiple types of figures including abstract ones, the panel seems to suggest the use of nets to capture game. 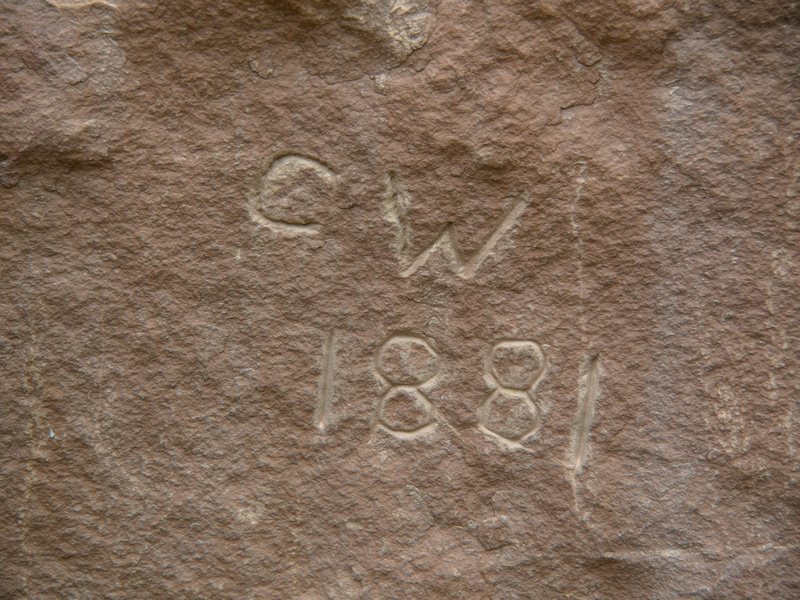 This inscription is dated 1818 which would make it pre-date the Mormon settlers arrival. It is possible that the first "8" is really a "9", but the style seems to closely match the second eight. 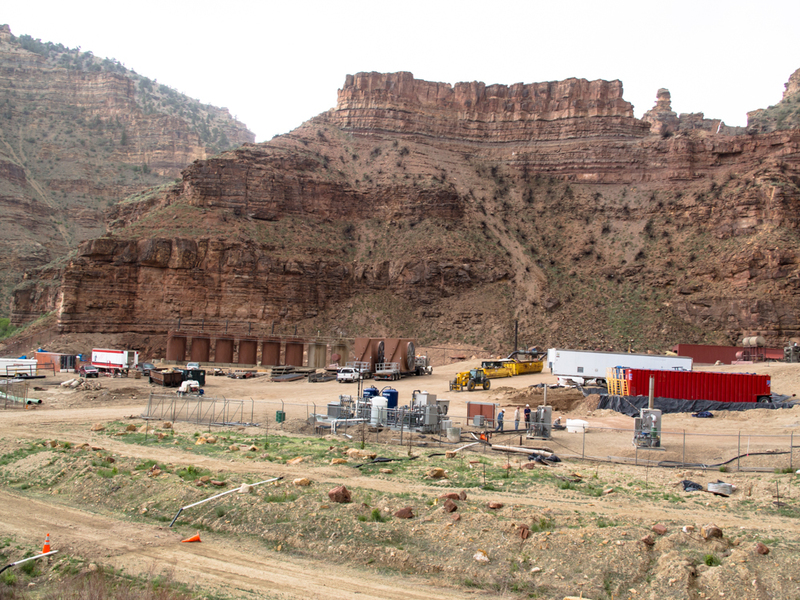 Deep into the canyon we came upon a natural gas compressor station under construction. Note the radiators on truck beds in the center of the photo. A short distance up the canyon we came upon this detailed panel. 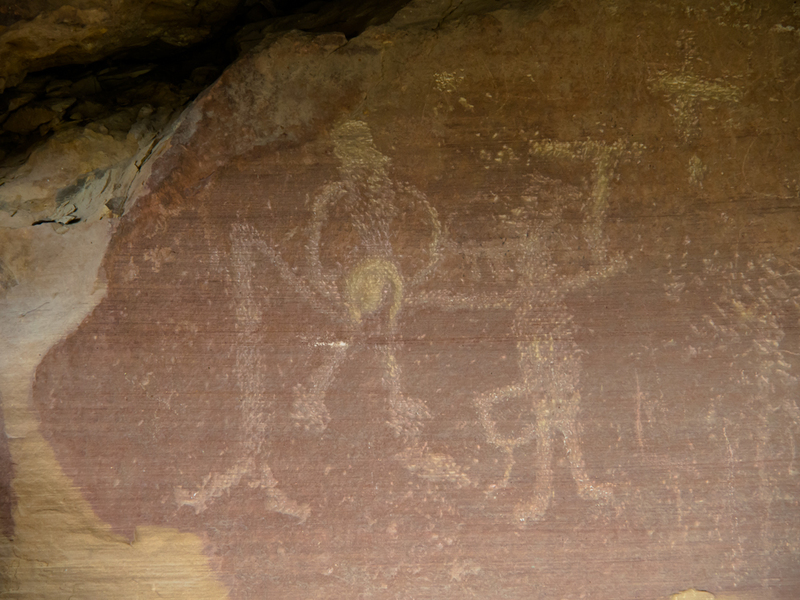 This panel was carved into a spalled section of the cliff and the canvas was not dark resulting in low-contrast images. 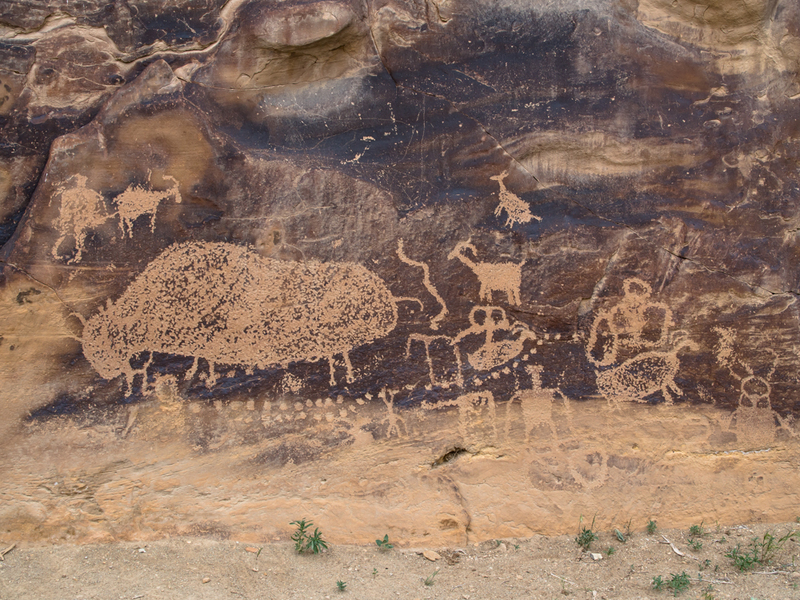 But, despite the poor contrast, this is a very busy panel with sheep, buffalo, snakes and shamanistic figures. This panel used a different style of writing: a scratching method rather than pecking. 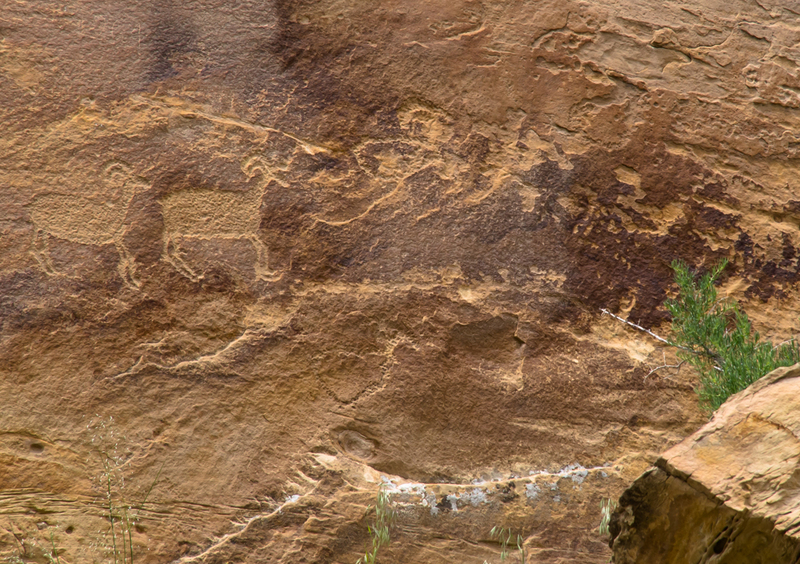 This panel, pecked into sandstone coated with desert patina, shows a hunter with bow engaging a sheep. At my first glance at this panel, I thought it was a depiction of a birthing scene. Now I am not sure. 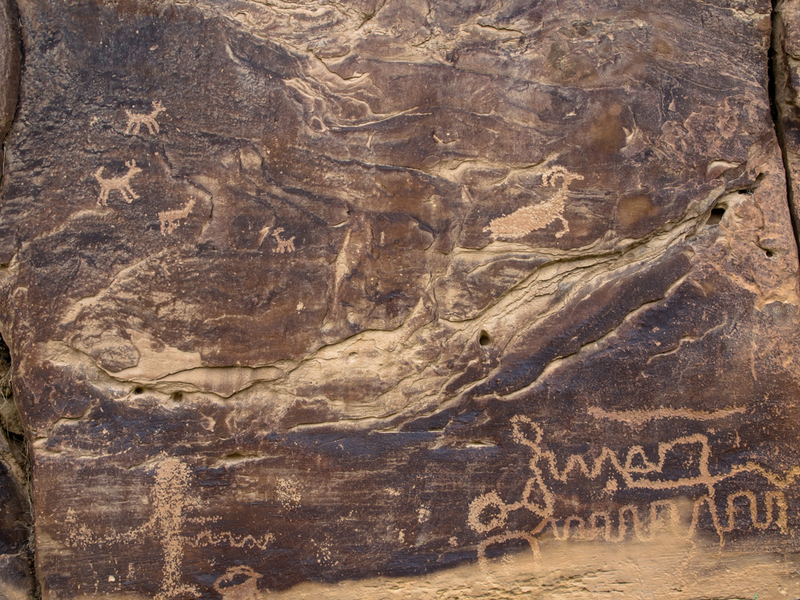 This panel was the best preserved and highest contrast site in the canyon and was named "The Great Hunt". 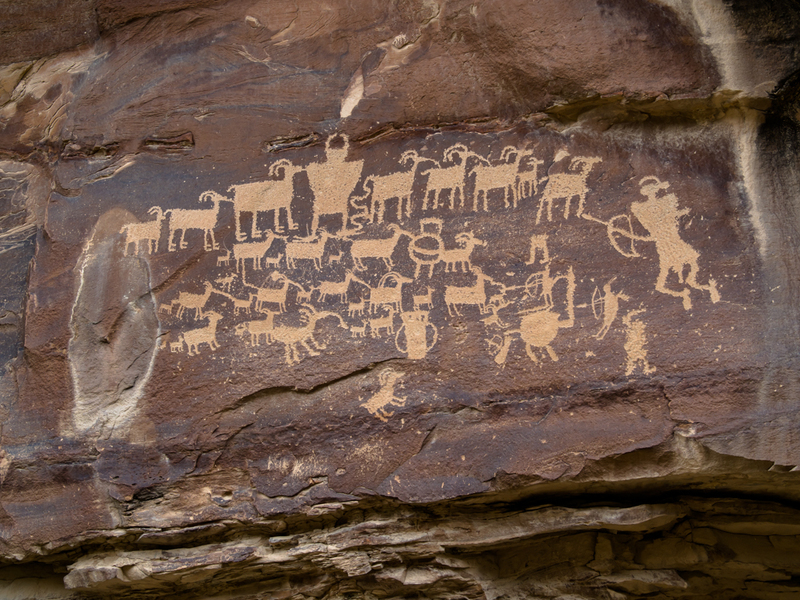 The panel shows rams, ewes and lambs being engaged by hunters with bows. Interesting that sheep are almost always shown with their heads on the right. Close to The Great Hunt there was more evidence of graffiti damage. 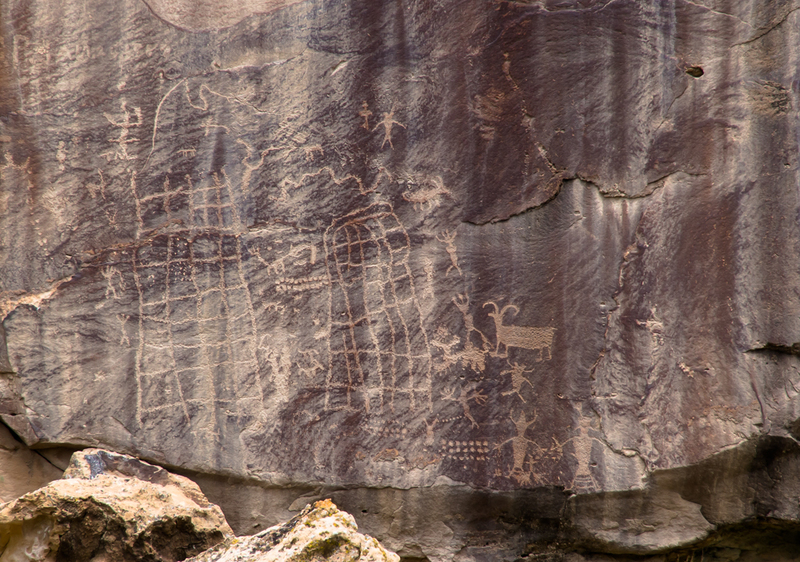 Despite the weathering, this busy panel contained interesting symbols that were repeated throughout the west. This panel was named "Big Buffalo" for obvious reasons. The abstract symbol at the lower right may be a representation of a snake. It is not clear if the icons at the upper left are dogs or deer. 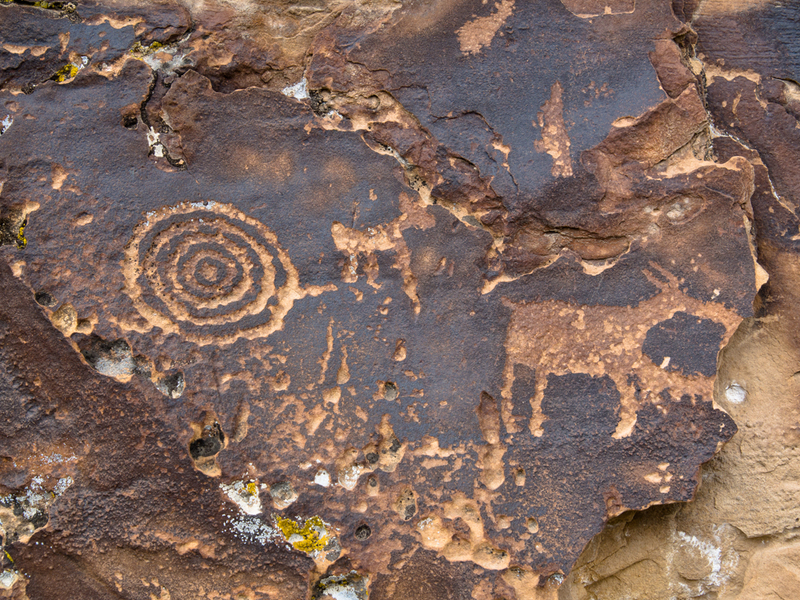 Concentric circles are a common icon throughout the west. 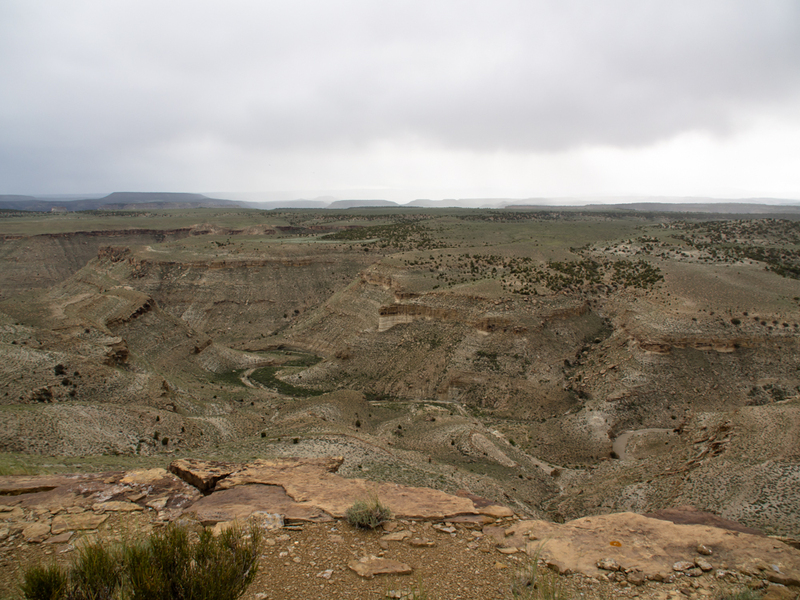 The canyon continued for many miles and finally dead-ended in private land. 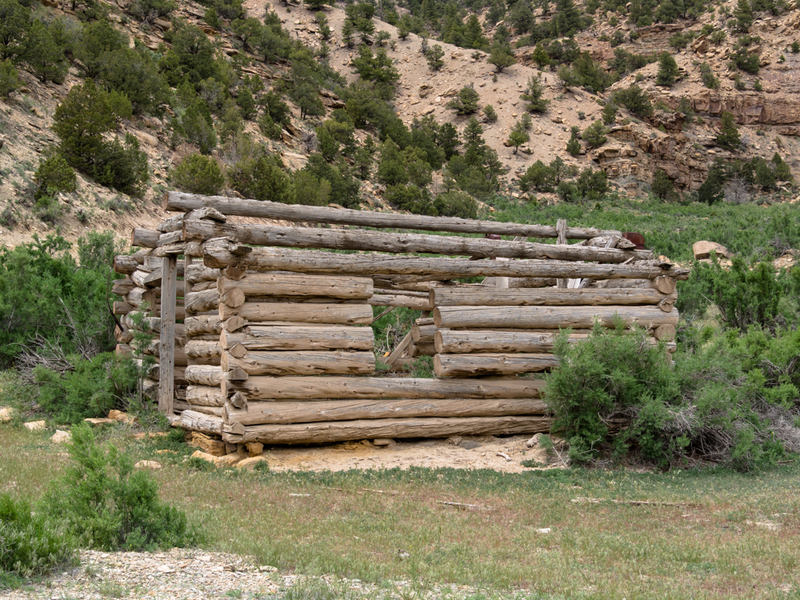 This log cabin was visible from our turn-around point. 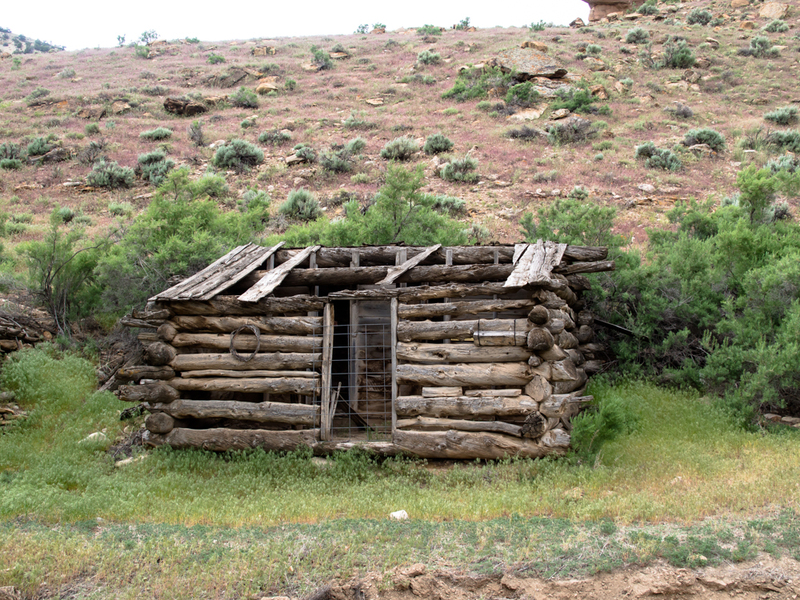 I think this was the V2.0 dwelling after the log cabin was abandoned. Due to the private land holdings, finding a camp spot was out of the question. So we took a side road and headed north further into the cliffs. 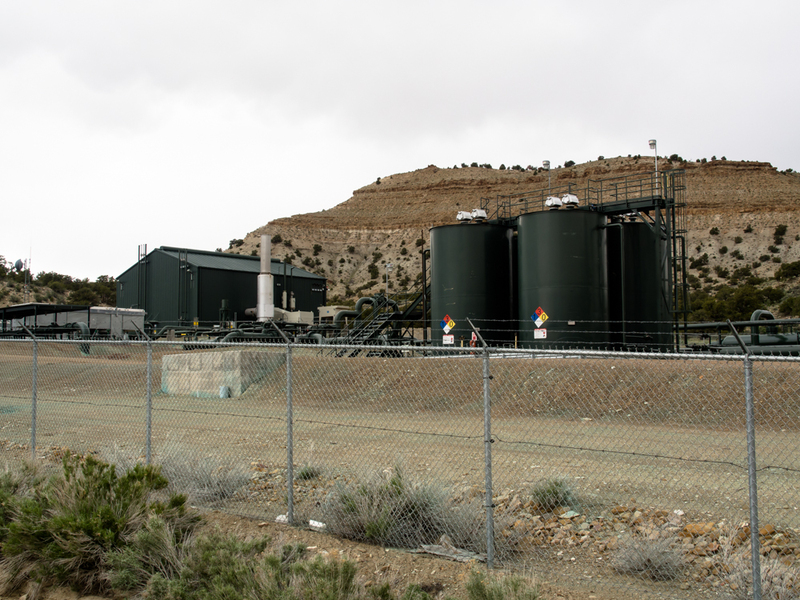 We turned east toward the Green River and crested a large ridge to find this gas compressor station on the ridge. The dark wire on the fence is an intrusion detection sensor to prevent vandalism. Too bad that the petroglyphs did not have a similar system. 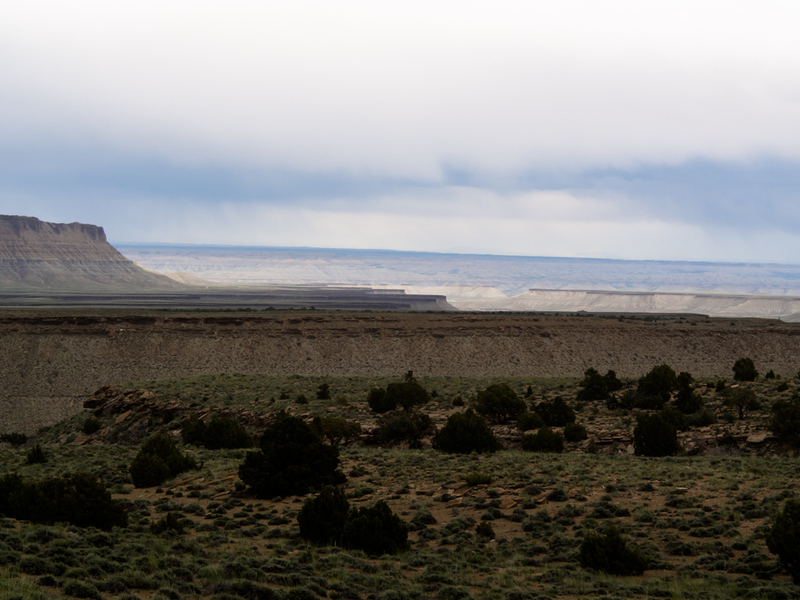 The east side of the ridge had expansive views of the canyons that lead to the Green River drainage. It was blowing hard on the ridge and rain was getting stronger. To the east of the ridge, I spotted this track that headed south toward the cliff escarpment. We were looking for a camp and being on the cliff seemed like it would provide a great view, so we followed the trail. The trail ended at an escarpment as predicted and the view was better than expected. But, the wind was about 50 mph on the lip so we decided to retreat a few hundred meters to reduce the rocking of the camper. Despite our set-back from the lip of the cliff, the wind was howling as we set up camp. 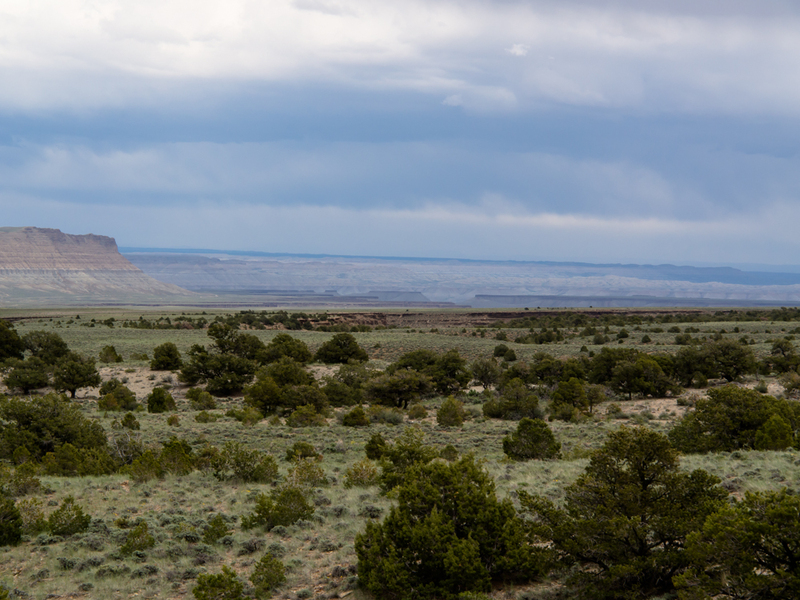 But, our site still had a great view of the canyonlands to the east. Price, UT is a working-class town centered on ranching and mining. We found several good places to eat and got all of our re-supply needs met. If you are in the Price area, you should stop at the Main Street Grill. 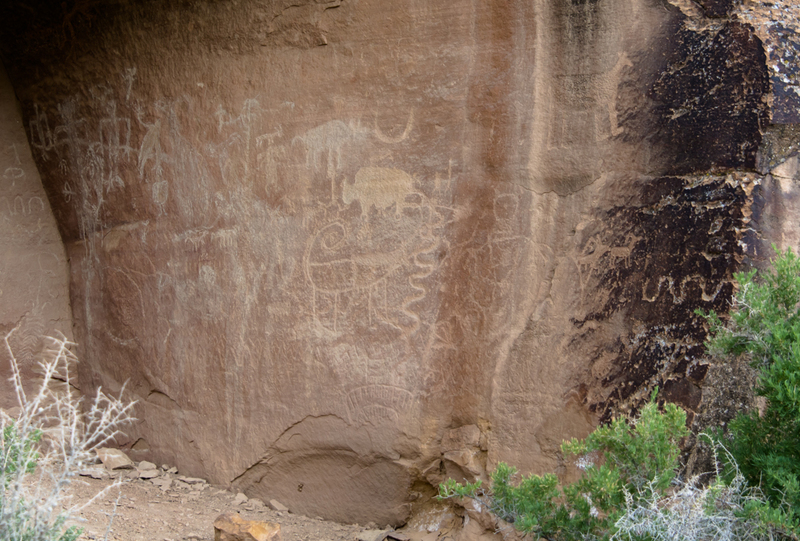 Nine Mile Canyon is a paved road with easy access to the petroglyph sites and is a must-see if you like rock art. Tomorrow, we are planning on continuing north toward Vernal, UT.